Like other major destinations in Europe, London lights up its popular sights for the holidays in the West End, on Regent Street and Trafalgar Square. Also, holiday concerts are held at St Paul's Cathedral and Westminster Abbey and you can catch a performance of the Christmas Carol Sing-Along at Royal Albert Hall. The English National Ballet presents its annual Nutcracker at the London Coliseum while the Royal Ballet often presents its verson in some years at the Royal Opera House at Covent Garden. Take a ride on the London Eye in a special capsule transformed into an ice cave. 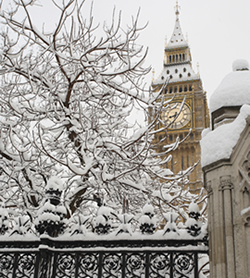 It includes a guided tour tying landmarks to stories of winter and the holidays in London. Experience the phenomenon of the Northern Lights during the winter. Aurora Sky Station in Swedish Lapland, accessible by a chair lift, serves as one of the best viewing spots. Also, stay a night or two, if you like the cold, at the stunning ICEHOTEL the rooms of which are constructed entirely of ice and snow featuring works by artists from around the world.